WRAP UP WARM if you’re going outside tonight. Met Éireann has issued a weather warning for stormy conditions throughout most of the country this evening and tomorrow. Gale force winds are expected to hit most of the country tonight and into Tuesday with winds of up to 130 kph. AA Roadwatch has advised motorists to drive with extreme care, particularly on exposed roads or over high ground, and to watch out for pedestrians, cyclists and motorcyclists. 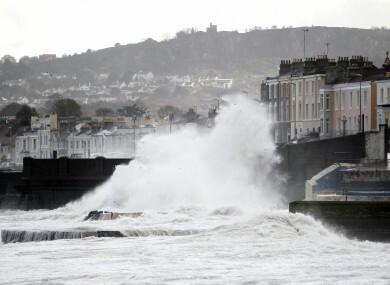 There is also a threat of flooding in coastal areas due to a combination of high seas along the northwest, west and southwest coasts coupled with high spring tides. Winds are expected to reach storm force 10 along some coastal areas tonight and into Tuesday morning. Email “Met Éireann warns stormy conditions set to hit tonight”. Feedback on “Met Éireann warns stormy conditions set to hit tonight”.